Treat your sweetie to a truly unforgettable romantic dining experience on February 14, 2019. The intimate ambiance, gourmet cuisine, outstanding service, superb wine list and live music make Talia’s the ideal spot for that special someone. Mellow, romantic live music (jazz & blues duo) starting around 7PM. Limited a la carte menu may also be available. 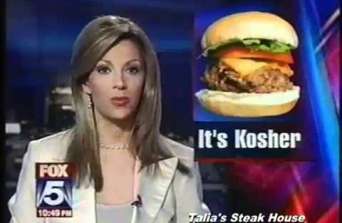 Is Valentine’s Day kosher? Wanna be intellectual? Click here to read Rabbi Michael Broyde’s opinion. Rabbi Broyde was the founding Rabbi of the Young Israel in Atlanta and is a member (dayan) in the Beth Din of America. Click here to listen to Zev Brenner from Talkline Communications interviewing several Rabbis about the topic. Talia’s Steakhouse’s catering servers are fully compensated for such religious events and/or for all on and off-premises catering, banquets, special prix fixe functions and package deals. Prices charged are all inclusive and no part of the price is purported to be a gratuity. Only sales tax shall be added to the bill. Give us a call at 212.580.3770 to reserve now!